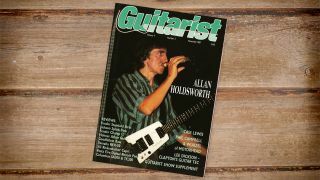 In this classic interview published in Guitarist in 1987, Holdsworth reveals some of the inner workings of his unique approach to composing, recording and playing live. Unjustly, that uphill battle continued throughout his career. 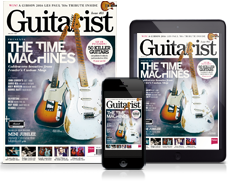 Here, via a Guitarist article from November 1987, we revisit his thoughts on music, the guitar and his renowned self-critical take on his own playing. “The electric guitar’s a pretty cheesy thing when you think about it, still working on those bits of wire and magnets for its sound. It’s all of the things that are wrong with it that have made it the unique instrument it is. “I made this box that you just plug into the output of any amp. It has an output with a volume and a tone control on it. It’s a totally isolated output and it plugs into stereo processing or a mono power amp so you can control the volume from zero to whatever. And it captures all of the sound of the original amplifier. “Any guitar player knows about trying to get a consistent sound in the studio. You can go in and move the speaker cabinet and the microphone around for a while and still not be happy with it, so I made a totally enclosed box that has the microphone and the speaker in it and you can change any of the speakers. “One guitar sound I was pretty pleased with was the one I used on 4.15 Bradford Executive. I used two amplifiers on that, a 50-watt Marshall and a 15-watt Gibson, and each of them was going into its respective ‘tweak’ box. “I like to see something and then think of something that it conjures up musically. I’ve always done that. Most of the tunes have had some kind of meaning even though it hasn’t been overly apparent from the title. “I see a whammy bar as being like the phase pedal - everybody’s got one now - but when I was looking for whammy bars on guitars in 1972, they all thought you were insane. Now you can’t even sell a guitar if it doesn’t have one on. So, to me, it’s a superficial thing, bound to have a fleeting use. “When I practise scales I will play four notes on one string. If I’m playing a C major scale, starting on F, I’ll play the F, G, A, and B on one string and the C will be on the A string, etc, etc. Because I found not only was it good for my hands but it was really good for interconnecting things. “I never use pull-offs because I don’t like the sort of ‘meow’ sound they make with the string being deflected sideways. So I kind of tap the finger on and lift it directly off the string. I practise trying to make all the notes play the same volume or even some of the notes I’ve hammered, louder than the notes I’ve picked. So you can place an accent anywhere you normally would if you were using a pick. “The basic major7 chord - the first one you probably learn on the guitar - is absolutely offensive to me. It’s horrible and I’ve always felt that about chords even before I started playing and knew what they were. “I’d hear a certain chord and go, ‘Yuck!’ So because of this, I just started experimenting by taking three or four notes and I’d take a triad and go through all the inversions I could get on the lower three strings, then do the same on the next three, and so on. “I don’t like altered dominant chords. I don’t like the way they sound and, obviously, there are more of them than any other type of chord, so I always try to substitute them or put the notes in an order where the sound you hear isn’t so easily recognisable as just a nasty old altered dominant chord. Soloing on this stuff is hard! “You’d assume that because I’ve written the thing it would be easier for me [to solo over it], but it’s not. In actual fact, some of the tunes that I’ve written I find incredibly difficult to solo over, and sometimes I have to sit down for a long time. Because it’s one thing to harmonically create something and it’s another thing to blow like crazy over it. “Sometimes [I practise] a lot, sometimes not. I don’t have a set schedule, but I usually end up playing at least once a day. Generally, if I come back off the road I’m too wasted to do anything. But at the same time I always come back feeling really disappointed in my performance and look to make the things I did that sounded lame, sound better. “I record gig tapes from two or three tours ago and listen to them and get a truer perspective of what’s happening. When I listen to them after the gig, I hate them because you are really close to it and you know what you were trying to do. You know what happened and what didn’t happen, but six months or a year later you’ve kind of forgotten what you were trying to do on a specific gig and you can listen to it from outside it.